So far we have been talking about revisions as though each logically follows exactly one revision before it, in a simple sequence of revisions. This is a rosy picture, but sometimes it does not work out this way. Sometimes when you make new revisions, other people are simultaneously making new revisions as well, and their revisions might be derived from the same parent as yours, or contain different changesets. Without loss of generality, we will assume simultaneous edits only happen two-at-a-time; in fact many more edits may happen at once but our reasoning will be the same. We call this situation of simultaneous edits a fork, and will refer to the two children of a fork as the left child and right child. In a large collection of revisions with many people editing files, especially on many different computers spread all around the world, forks are a common occurrence. 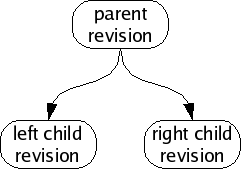 If we analyze the changes in each child revision, we will often find that the changeset between the parent and the left child are unrelated to the changeset between the parent and the right child. 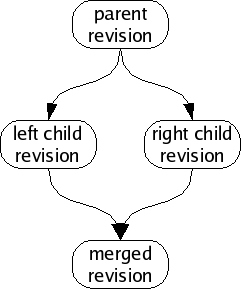 When this happens, we can usually merge the fork, producing a common grandchild revision which contains both changesets.